Our Automatic Practice Management System is the result of years of first hand experience in the healthcare industry and decades of experience teaching practices the skills they need to succeed. Our supplemental follow up materials to the "Local Medicare Changes" course do so much more than even their name implies. They are designed to completely automate the vital tasks that many practices unknowingly struggle with. By implementing our systems, the methods you’ll use for staff training, collections, re-filing returned claims, eliminating processing errors, promoting your practice, and managing your business will be so ingrained in your practice as to be automatic. The Automatic Practice Management System retails for $2557.00. There is a discount offered for those who have attended previous courses offered. The System includes hours of audio training, reading materials, and all the “must have” charts, indices, forms, and letters you need to run your practice at optimum efficiency. Included with your purchase is unlimited phone support (for two years from your date of purchase) to ask those tough questions that you can never quite get answered by the insurance companies. In addition, these materials are approved for 12.0 CE credits, further making the time you spend investing in building your practice worth your while. To purchase or for additional information, call (800) 669-3328. The Medicare Edition of our Automatic Practice Management System features audio and supplemental discs on Medicare Changes, Medicare and Insurance Fundamentals, Insurance Strategies, Patient Collections, and Practice Promotions plus the 2018 Medicare Changes and Medicare & Insurance Fundamentals books and discs. This book and disc serve as a guide to your entire Practice Management System. We summarize the most pertinent information from each segment so you have an easy reference guide. Medicare participants must have a Medicare Compliance Program in place. By not having a compliance program implemented in your practice, you are a subject to liability. All the necessary tools to be fully compliant are included in the Medicare Fundamentals segment. You will learn how to avoid costly mistakes while submitting your claims, how to receive maximum allowable reimbursement, how to re-file your claims and get paid, how to properly use modifiers, how to appeal your claims and get paid and many, many more useful and practical topics. You will learn how to apply most effective strategies on getting paid timely, increase revenues, renegotiate contracts, protect your practice from demands for refunds and overall contribute to practice growth while eliminating uncertainty and wasteful activities. Everything you need to know about collecting at the time of treatment, reducing past due accounts, scheduling effective payment arrangements, dealing with non paying patients and much, much more is revealed in the Insurance Collections segment of the System. Staff members very quickly learn collection laws and regulations which allow maximizing productivity while staying compliant with HIPAA. The first three factors are fully addressed in the Insurance Strategies and Patient Collections segments. In the Practice Promotions segment you will learn the most effective methods of growing your practice, acquiring new paying patients, reactivating patients, improving your reputation, getting more referrals and running the most successful promotional campaigns. These strategies are proven to be the most cost effective and do not require a large marketing budget but create a tremendous difference in your practice’s future. Precise filing of Medicare claims has become absolutely mandatory. Comprehensive Error Rate Testing (CERT), Recovery Audit Contractors (RAC), Zone Program Integrity Contractors (ZPIC), and Healthcare Fraud Prevention Enforcement Action Team (HEAT) auditors know how to spot your patterns for potential miscoding and vulnerabilities which lead to extractable overpayments. The Medicare materials are designed to help you spot your problems and correct them before the auditors do. Every practice should be preparing for ICD-10 and aquiring the basic concepts for transition including General Equivalency Mappings, the associated flags, and terminology, as well as the alpha numeric logic to eliminate frustration and delay of claim submission and payment. E&M miscoding continue to meet required guidelines lead to an unacceptable error rate and unnecessay overpayments. Avoid costly mistakes by submitting your claims to receive maximum allowable reimbursement to earn what you deserve; not a penny more, but certainly not a penny less. Re-file and self audit your returned claims not only to get paid, but to avoid future errors and protect your practice from becoming an audit trigger. Know how and when to file an appeal for an alleged overpayment plus more useful and practical topics. Practices that establish and utilize a Compliance Plan are more successful than those that do not. To avoid potential liability, miscoding, and overpayments everyone in your practice should be held to a standard of compliance. The Medicare materials provide training in audio and text format as well as all the necessary charts, guidelines, and reference materials to prepare your practice for the changes and elevate your practice to a higher level of profitability, accuracy, and compliance. The objective of the insurance training materials is to quickly train staff members to manage insurance matters while increasing reimbursement. You will learn how to apply the most effective strategies to get paid according to legal guidelines, increase revenues, renegotiate contracts, protect your practice from demands for unauthorized refunds and contribute to practice growth while eliminating uncertaintly and wasteful activities. Everyone in your office has a significant tie to the collections process, and it does not have to be the burden it has become to the healthcare industry. The Collections portion of the training materials provide everything you need to know about the proven four step collection method from making the appointment, to when the patient comes into your office, immediately after the appointment, and within 15 days of the appointment. You'll learn more than you thought possible about collecting at the time of treatment, reducing past due accounts, scheduling effective payment arrangements, spotting problem patients, and tactfully dealing with patient objections. These skills are vital in the business of healthcare today, and it's easier than you think. Most healthcare providers today would like to increase their fee-for-service clientele and create more income, but only a few of the most successful practitioners are able to achieve that goal. 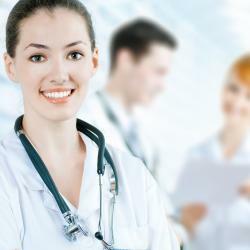 There are four essential factors that alow doctors to enjoy maximum revenues. The first two factors are fully addressed in the Insurance and Collections manuals. In the Promoting your Practice segment you will learn the most effective methods of growing your practice, aquiring new paying patients, reactiviating patients, creating referrals, and the most successful methods to promote your practice. These strategies are proven to be very cost effective and low key, but create a tremendous difference in your practice's future. The materials include audio training as well as text readable format, with many low-budget, easy to implement marketing ideas as well as the letters and forns necessary to promote your practice and create a flourishing and profitable business. Also known as the Gold Book, the Medicare / Insurance Fundamentals contains the most current and valuable information as well as the necessary forms, letters, scripts, charts, graphs, stickers, and other documents that you will need to implement the strategies discussed in the training. Using the Medicare / Insurance Fundamentals book in conjunction with the audio training will bring thousands of dollars to your practice for years to come. The cover of the book displays a checklist of a very simple, no nonsense approach to practice management. The Medicare / Insurance Fundamentals materials are also provided on a disc to further turn this system into a point-and-click recipe for success.